Join VoiceWorx 25! - CREATIVOICES PRODUCTIONS I "The Voice of Creativity"
Here at CreatiVoices, we help you realize your dreams of becoming a voice artist. We prepare you by making sure that you get the proper training on how you should use your voice to give life to different applications. We boost your confidence, too, and we help you develop your personality–all these, we do under the supervision of the country’s best voice artists. And when you are done with all the necessary training, we make you a part of the big and still growing group of young voice artists. With them, you can learn a lot of things and even make new friends. Sounds interesting, right? 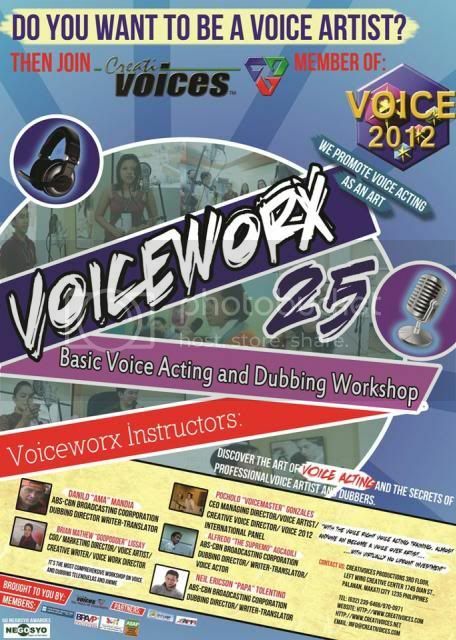 Call us now at (02) 239-6468 and join the 25th Batch of VoiceWorx: Voice Acting and Dubbing Workshop! I would like to ask if you also offer such seminars in other regions of the Philippines? I know of many people who are very interested in entering the voice acting business, and want to take professional training in this area. They already have the innate talents in voice acting, but they still believe in proper practice in voice acting. However, because of the incapability to pay for airplane fees to Luzon, they have second thoughts in participating in the seminars. I think it would be a great idea if Creativoices considers branching out and encompassing all regions of the Philippines and produce more talented voice actors. Hey! I’m interested in this, but could I get a mobile number? We don’t have a landline and i really want to try this out. Is this open nationwide? Thanks! please e-mail me. eeto… How many days is this?? Is it free or what? Hi! The workshop is good for eight sessions (eight Saturdays). For more information about the workshop, you may visit http://voiceworxworkshop.webs.com.